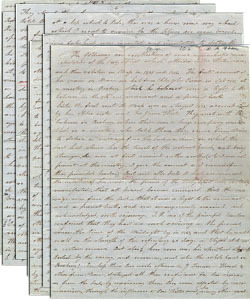 Click on the picture to see the original handwritten document, the text of which is transcribed below. Keep in mind that it will take some time to download. The first account of her vision in Maine we had from Elder John Pierson in February, 1845, at a meeting in Roseburg, which he believed was a light to the believers in the seventh month movement, and a present truth. Sister White's first visit to Mass. [Massachusetts] was in August, 1845, accompanied by her older sister and Bro. James White. They met with the believers in Roxbury where there was a large company assembled in a meeting. She told them they came from Maine to deliver a message from the Lord--a vision in which the Lord had shown her the travels of the Advent band, and being strangers, she was at first received rather coldly. As I was not present at the meeting, I gave the account as I received it from the principal leader. But soon after Sister White had commenced the relation of her vision, the power of the Holy Ghost was so clearly manifested that all present became convinced that the message was from the Lord--that it was a light to the remnant and a present truth, and was unanimously received and acknowledged with rejoicing. T. H. Haskins, one of the principal leaders, confessed that they had no such reviving as the present since the time of the midnight cry of 1844, and that he could walk in the strength of the refreshing for forty days, as Elijah did on a certain occasion. But alas! How soon was his spiritual strength tested, and overcome by the enemy and also the whole band in Roxbury! In less than two weeks afterward J. Turner, Howel, and others from Maine destroyed all their confidence in the visions as from the Lord by convincing them that they were effected by mesmerism through the influence of Bro. White, also many other malicious falsehoods were invented and circulated to destroy the effects of her vision and their influence in Mass. [Massachusetts]. T. Haskins gave himself to Turner to aid and assist, to raise means to travel to overthrow her visions where they were received. This warfare continued for a long time until they made shipwreck of themselves. T. H. [Haskins] was afterwards sentenced and served two years in the county prison for a violation of the seventh commandment. Others have died, and a number of others have renounced the Bible. The day following Sister White's visit to Roxbury they came to our house which they made their home while traveling in Mass. [Massachusetts]. On the next Sabbath they went to Randolph to relate her visions. There was a large congregation of believers there assembled. The same power of the Spirit was manifested at Randolph in her message as at Roxbury, and it was there also unanimously received, and many there continued for a while to enjoy the confidence and fellowship of Bro. and Sister White. But the enemy followed Sister White at every place she went, and destroyed the effect of her visions except in the vicinity of New Bedford. Turner, Haskins, and others were completely successful in overthrowing the Randolph band. After her visit at Randolph she was shown in vision that there were other places south that they must visit--New Bedford, Dartmouth, and Carver. Those places were visited soon afterward with the same manifestations of the Spirit attending and effects as the former places. There was a particular providence that followed them in their journey to different places. From N. Bedford to Carver is about twenty-five miles [40 km]. We were perfect strangers to the way, and to the towns we passed through. After traveling about five hours we concluded that we must be in or near Carver. We came to a place where two roads branched off, and we were at a loss which to take. There was a house some way ahead to which I went to enquire for the place we were bound. But what was our surprise to learn that this very house was the one for which we enquired. This was on the Sabbath, I think, and a large assembly was there collected in meeting. In the P.M. Sister White related her vision, which was unanimously received with rejoicing. Their preacher was greatly blessed and revived, with many others. The next morning, Sunday, Bro. Leslie proposed to Sister White, Sarah and a brother to accompany him to Mattapoisett, about 25 miles [40 km] from Carver where he preached a part of the time, to relate her vision to the brethren in that place. This was assented to, as Brother White wished to talk to the brethren in Carver on Sunday upon a particular subject. Arrangements were made, and Bro. L., Sister White and the others referred to, set away on Sunday morning for Mattapoisett. Bro. L. was well acquainted with the way, as he had previously traveled the road. After traveling about four hours, and thinking they had nearly arrived at M. [Mattapoisett], they were much surprised to find themselves not two miles [3 km] from the place they started from in Carver. Thus the Lord frustrated the design of Brother L. and Sister White in going from Carver before her work was accomplished, and on Sunday P.M. Sister White finished her message at Carver, and the next day returned to N. Bedford to visit Dartmouth. In every place where Sister White related her vision there was a remarkable manifestation of the providence and power of the Holy Spirit. But the most remarkable manifestation of the Lord attended a vision of Sr. White at Randolph a few months afterwards. The bands of believers in Boston, Roxbury, and Randolph--a large company--had become almost totally alienated to Bro. and Sister White through the false teachings, deceptions, and Satanic influences of J. Turner and his associates, T. Haskins, Howel and others. They were influenced to believe that her visions were of the devil, that Bro. White mesmerized her, that she could not have a vision in Bro. White's absence, and many other false charges were made against her. After this state of things continued for some months, I proposed to Sister White and Sarah, her sister, who were then at their father's house in Portland, to come up to Boston without Brother White accompanying them, to visit the bands in Boston, Roxbury, and Randolph, and wherever the war against visions was manifest, to convince them if possible that they had been deceived by their teachers. They assented to this arrangement, and Sister White and Sarah accompanied me to Mass. [Massachusetts], leaving Brother White in Portland, and made their home at our house. A few days after their arrival, G. Sargent and Robbins, two of the principal leaders in Boston, and obstinate opposers of Sister White's visions, came out to our house to talk to us and have prayers. I told them that we were glad of this opportunity with them, that Sister White and others were now with us, and we invited them to come in. But hearing of Sister White's presence, they departed, and made other reasons for coming here. Robbins then warned me against her visions, and said he knew they were of the devil, that he always felt a blessing whenever he declared they were from Satan. I told him we judged their character by their fruits, their doctrine in accordance with Bible testimony, and the effect upon those who believed them, leading them to a more holy and devoted life and confirming their faith in the past experiences of the Advent doctrine of 1843 and the seventh month of 1844, and enlightening our understanding in the present truth, and that we were acquainted with her moral character; that Turner and others had maliciously calumniated her without any facts and evidence; that Turner once said that he believed her visions were as true as the apostle John's and that the only reason T. [Turner] turned against Sister White's vision was because she saw his hypocrisy in vision; and that he was exposed; and that others in union with him were doing all in their power to destroy all faith in her visions. I then told them that Sister White desired to attend their meeting in Boston the next Sabbath, and asked if there would be any opposition to hearing her testimony. Sargent replied, "None at all; let her come next Sabbath." Accordingly we arranged to meet in Boston, according to agreement. But in the evening preceding the Sabbath Sister White saw their hypocrisy in vision, that there would be no meeting in Boston on the Sabbath; that S. [Sargent] R. [Robbins], and others opposed would meet with a large company in Randolph at their meeting on the Sabbath, and there she would have a message given her for them, which would convince the honest, unprejudiced ones whether her visions were of the Lord or from Satan. Accordingly we went to R. and arrived rather late in the forenoon, and found S. [Sargent] and R. [Robbins] and F. [French] and a large roomful assembled in meeting. Their preachers were a good deal confused when we entered, as well as many others present, for they had expected we should have gone to Boston. They closed the forenoon exercises rather early. Sargent told them to come early in the afternoon, and have a short intermission; a good matter would attend the meeting yet, notwithstanding present appearances, to which some of us responded, I believe it. About one o'clock the meeting was opened by singing and praying by S. [Sargent] R. [Robbins], and French; then one of us prayed for the Lord to lead this meeting. Then Sister White commenced praying and was soon afterward taken off in vision with extraordinary manifestations and continued talking in vision with a shrill voice which could be distinctly understood by all present, until about sundown. S. [Sargent] R. [Robbins], and F. [French] were much exasperated as well as excited to hear Sister White talk in vision, which they declared was of the devil. They exhausted all their influence and bodily strength to destroy the effect of the vision. They would unite in singing very loud, and then alternately would talk and read from the Bible in a loud voice in order that Ellen might not be heard, until their strength was exhausted and their hands would shake, so they could not read from the Bible. But amidst all this confusion and noise, Ellen's clear and shrill voice as she talked in vision, was distinctly heard by all present. The opposition of these men continued as long as they could talk and sing, not withstanding some of their own friends rebuked them and requested them to stop. But, says R. [Robbins], "You are bound to an idol. You are worshiping a golden calf." Mr. Thayer, the owner of the house, was not fully satisfied that her vision was of the devil, as R. [Robbins] declared it to be. He wanted it tested in some way. He had heard that visions of Satanic power were arrested by opening the Bible and laying it on the person in vision, and asked S. [Sargent] if he would test it in this way, which he declined to do. Then Thayer took a heavy, large quarto family Bible which was lying on the table and seldom used, opened it, and laid it open upon the breast of Ellen while in vision, as she was then inclined backward against the wall in one corner of the room. Immediately after the Bible was laid upon her, she arose upon her feet and walked into the middle of the room, with the Bible open in one hand and lifted up as high as she could reach, and with her eyes steadily looking upward, declared in a solemn manner: "The inspired testimony of God," or words of the same import, and then she continued for a long time while the Bible was extended in one hand and her eyes looking upward and not on the Bible, to turn over the leaves with the other hand and place her finger upon certain passages and correctly utter their words with a solemn voice. Many present looked at the passage where her finger was pointed to see if she spoke them correctly, for her eyes at the same time were looking upward. Some of the passages referred to were judgements against the wicked and blasphemous; and others were admonitions and instructions relative to our present condition. In this state she continued all the afternoon until nearly sundown when she came out of vision. When Ellen arose in vision upon her feet with the heavy open Bible upon her hand, and walked the room uttering the passages of Scripture, S. [Sargent], R. [Robbins], and F. [French] were silent. For the remainder of the time they were troubled, with many others, but they shut their eyes and braved it out without making any acknowledgment of their feelings. Sister White visited Randolph a few weeks afterward for the last time, and as the principal members of the band still continued alienated from her, and the visions, she told them that the curse of God would soon follow their course. This was soon afterwards literally fulfilled. Satan took control of their minds and led them to confess publicly some of the most shameful acts of their lives, which had the effect to break up the meetings at Randolph and separate the honest souls from their unholy influence; and the principal leading ones united with Sargent, Robbins, and a company in Boston call the "no-work party"--a shameful company of fanatics numbering some twenty individuals whose principal teachings were denouncing and cursing those who believed in Sister White's visions, and all others, and also those who followed the exhortation of the apostle to be quiet and do your own business, to work with your own hands, and walk honestly toward those that are without, and that we may have lack of nothing. That with quietness they work and eat their own bread. They continued together in this state of feeling some time, a year or more, when they made a wreck of all their faith in the doctrines taught in the Bible and then broke up and scattered, declaring themselves free from all sinning, enjoined upon them in the Scriptures. Some of these teachers have since died, but I was informed the other day by Russel of Boston, one of their company, that the principal leaders of the company remain in the same state of mind as they were when they separated in 1847. Thus the curse of God was literally fulfilled upon those who obstinately continued to denounce the visions of Sister White after they had once been enlightened by them.